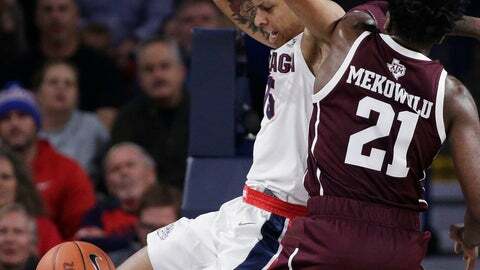 SPOKANE, Wash. (AP) — Gonzaga was flying up and down the court in the first half against Texas A&M, taking hurried shots, and coach Mark Few was not pleased. At halftime he told his team to slow down, and the No. 3 Bulldogs responded by blowing out the Aggies 94-71 on Thursday night. Zach Norvell Jr. scored 22 points and Rui Hachimura added 18 for Gonzaga, which had broken the 100-point mark in its two previous games. Brandon Clarke had 14 points and 11 rebounds for Gonzaga (3-0), which won its first three games for the eighth consecutive season. Five Zags finished in double figures. Gonzaga blocked 10 shots and had eight steals against the Aggies. Savion Flagg scored 18 points and T.J. Starks 16 for Texas A&M (1-2). The Aggies went to the Sweet 16 last season, but had major losses to graduation and the NBA draft. Coach Billy Kennedy was not immediately available after the game. “Starks is a heck of a player,” Few said. The Aggies were plagued by shooting in the 30 percent range most of the game, although a late flurry of scoring allowed them to finish at 41.5 percent. Gonzaga shot 49 percent. Neither team shot well in the early going, and Gonzaga led 16-14 with 11 minutes left in the first. The Aggies tied the score at 28, but Gonzaga went on a 15-5 run in the closing five minutes, including a pair of 3-pointers by Norvell, to take a 43-33 halftime lead. Hachimura and Norvell each scored 13 points in the first, while Texas A&M was held to 36 percent shooting. Gonzaga opened the second half with a 14-4 run to build a 57-37 lead. The Bulldogs held off the Aggies after that. Texas A&M won the only other meeting between the programs, in 2015. The Bulldogs never trailed in the game, and led by as many as 34 points in the second half. Corey Kispert and Clarke each recorded three blocks for Gonzaga. Texas A&M: The Aggies are the first SEC team to visit the McCarthey Athletic Center. The Aggies played without senior guard Admon Gilder, who has a knee injury. Gonzaga: The Bulldogs played without star forward Killian Tillie, who is expected to miss most of the nonconference season with an ankle injury. The Zags were ranked third in the preseason poll, highest in their history. Texas A&M plays at Minnesota on Sunday.